The most unique teambuilding game of the Benelux! Indoor skydiving is a unique experience: flying in a wind tunnel on the power of the wind! But what do you get if you combine indoor skydiving with the Twister game? The most unique teambuilding game of the Benelux, Tunnelwister. The teambuilding game Tunnelwister is what the name suggests, a combination of two activities: the game Twister and indoor skydiving. 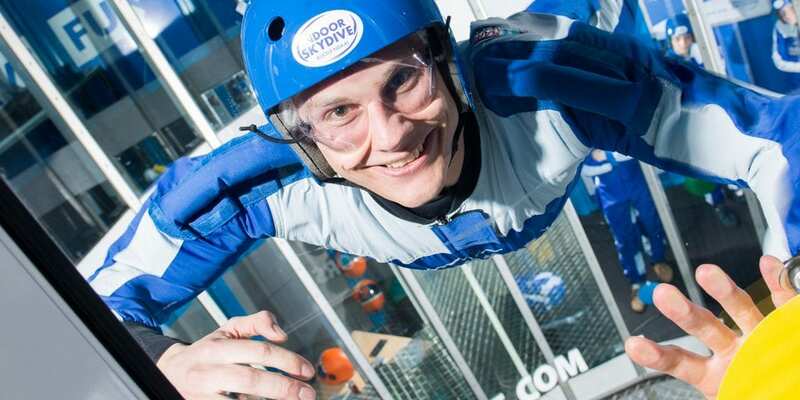 During the indoor skydiving you experience the feeling of a free fall, but then indoors. You will do this under the guidance of a professional instructor. You’ve heard of Twister’s game? Have you ever played it? Twister is known as the game with the colored dots, which guarantees fun and requires a lot of cooperation. That combined with indoor skydiving makes it the perfect team building activity. How do you play Tunneltwister? In the teambuilding game, only 2 materials are added to play the game: the twister board and the colored dots. At Twister you have to leave your hands and feet on the dots. At Tunnelwister, on the other hand, you only need to tap the dots and fly from dot to dot to score points. In addition, communication is the key to success. Due to the loud noise in the tunnel, it is impossible to talk, so by gesture your team must communicate to which point you have to fly. Of course, you can extend this arrangement with a delicious lunch, drink or dinner in the cozy Bravo24.